Cheese sauce --- 1 qt. Onions, sliced --- 1/2 qt. Red peppers, sliced --- 1/2 qt. Green peppers, sliced --- 1/2 qt. 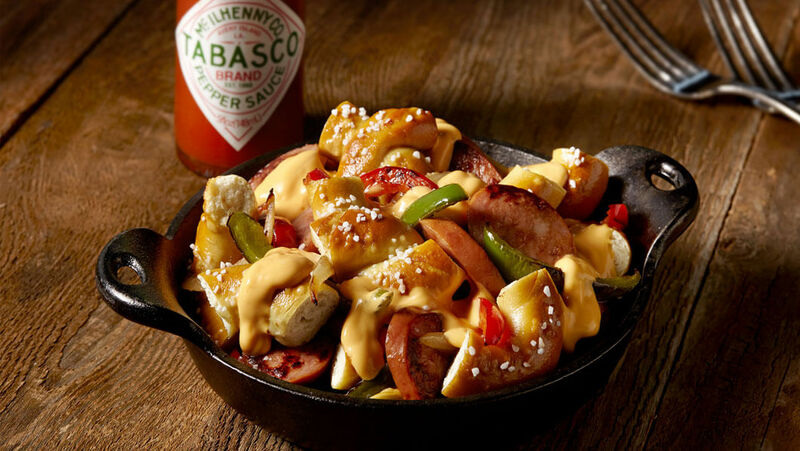 Combine TABASCO® Sauce and cheese sauce; keep warm in a steam table. In a large rondeau over medium heat, add olive oil and onions; cook until translucent. Add red and green peppers and sliced kielbasa. Cook everything until kielbasa is warm, 3 to 4 min. On a sheet pan, place pretzel nubs; Place pan into 350ºF oven until warmed through. Spoon kielbasa/vegetable mixture over the pretzels, then spoon warm cheese sauce over top.